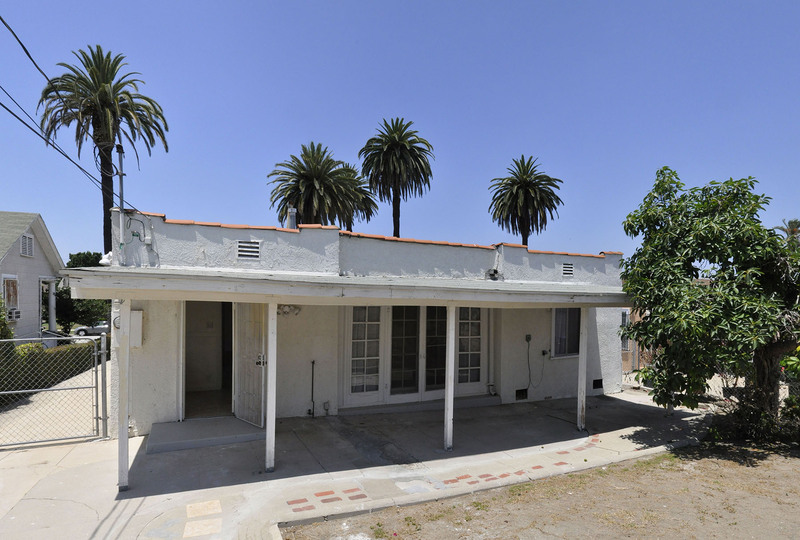 The area has been designated to be a historic district (Historic Preservation Overlay Zone in the official L.A. City Planning Dept. parlance) but the HPOZ won’t be finalized until later in 2016. 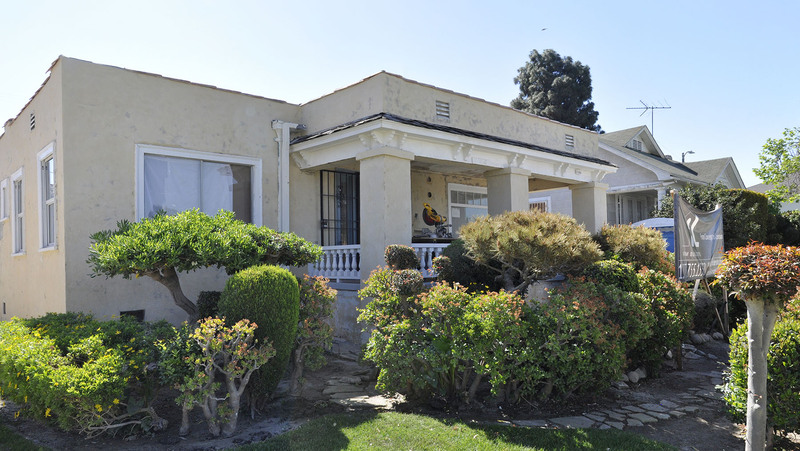 Meanwhile, the area is under an “Interim Control Ordinance”, which means that we aren’t allowed to modify any architectural features of the front of the house. This didn’t dampen our spirits much, since our clients mainly wanted a new kitchen, new master suite, and an overhaul of the interior to open it up and bring more light into the interior. The house has a nice sized back yard, but the original house didn’t have a very good connection to it. We deal with this a lot – older homes with chopped up, compartmentalized rooms and poor or no connection to the outdoors. Oxford Square house: Rear, before we started construction. Oxford Square house, rear. Current construction progress. The back of the house had a really rickety, run down shade structure attached to it, which we removed. There will be a trellis there eventually. 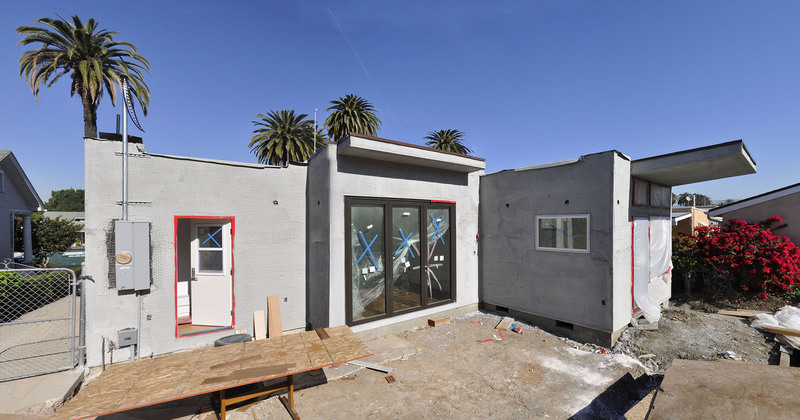 The large 3-panel door in the center will be able to slide open completely and fold to the side, connecting the new kitchen directly to the new patio. The space that will be the new kitchen used to be a weirdly enclosed sunroom of some kind that was so strange that during design, we all (clients included) called it the “weird room”. We also added a new master bedroom, at the far right in the above photo, with its own large patio door opening up towards the rear. In transforming the weird room into the kitchen, we opened it up to make it into one space with the dining room. This was a huge improvement, as the dining room previously had no direct connection to the outside. 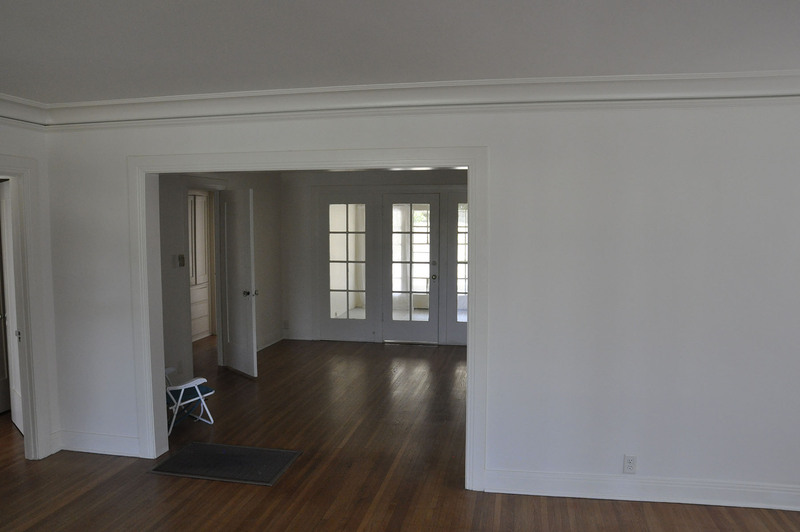 Before: Living room, looking towards the dining room. 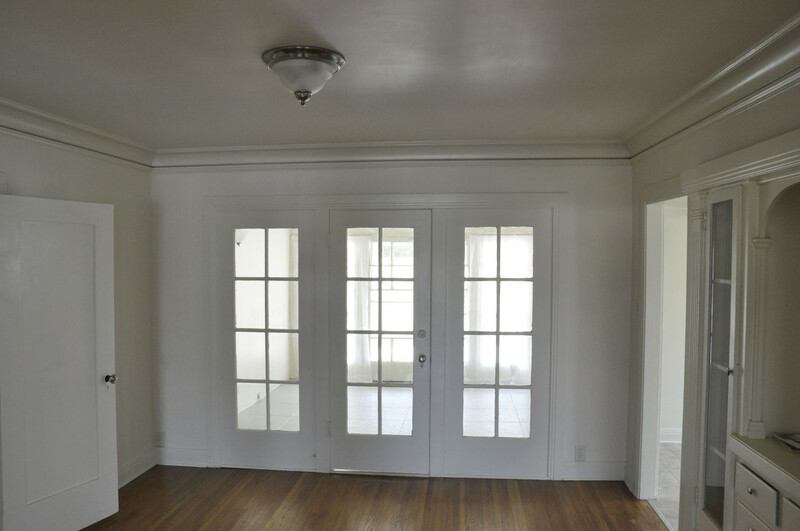 Before: Dining room, looking towards the weird room. Current progress: Living room viewing into the dining room and kitchen. 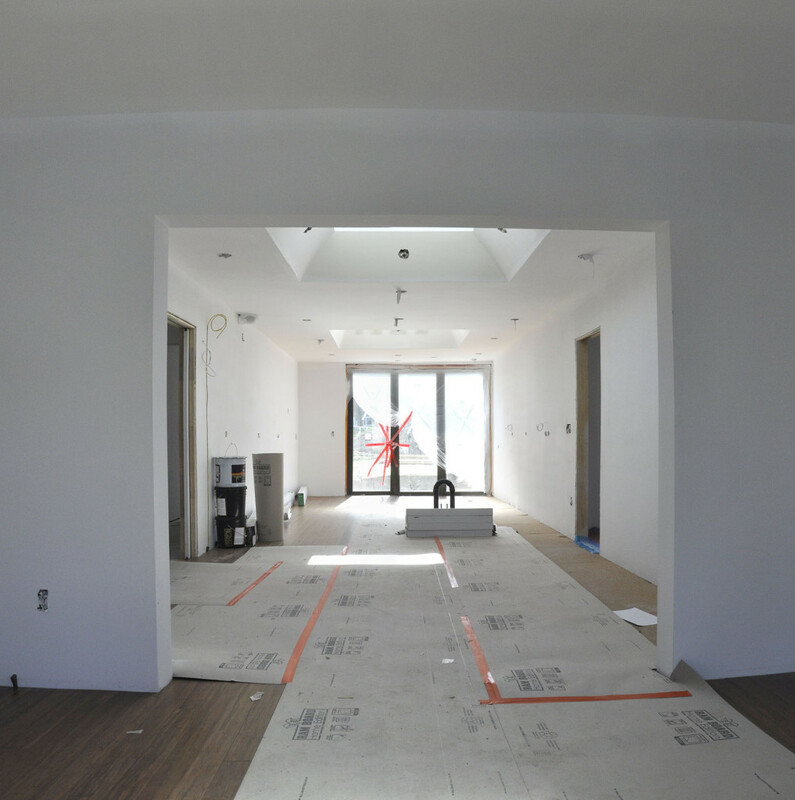 We also added two really big skylights, one centered above the dining table, and one centered above the main kitchen area. It has been exciting to see this all come together, after putting a ton of effort into the design through much of last year. I was really privileged to work in collaboration with my friend and colleague Scott M.B. Gustafson of Maison Orion on this project. We had some amazing brainstorming sessions, in a process that was filled with fun and a lot of synergy. 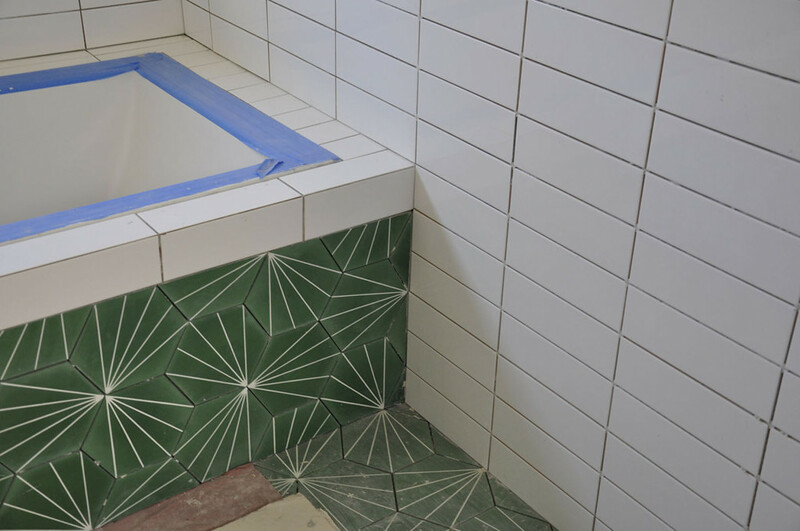 Another fun and really cool aspect of this project is that our client has a great love of intricate, geometric tile. She picked this tile for the guest bath, which is only one of the wonderful, playful tile designs that will be in the finished project. ‘Dandelion’ Moroccan cement tile installed in the guest bath. I’m especially pleased with the level of detail we were able to pull off with the way the tile all comes together at the corner of the tub deck. 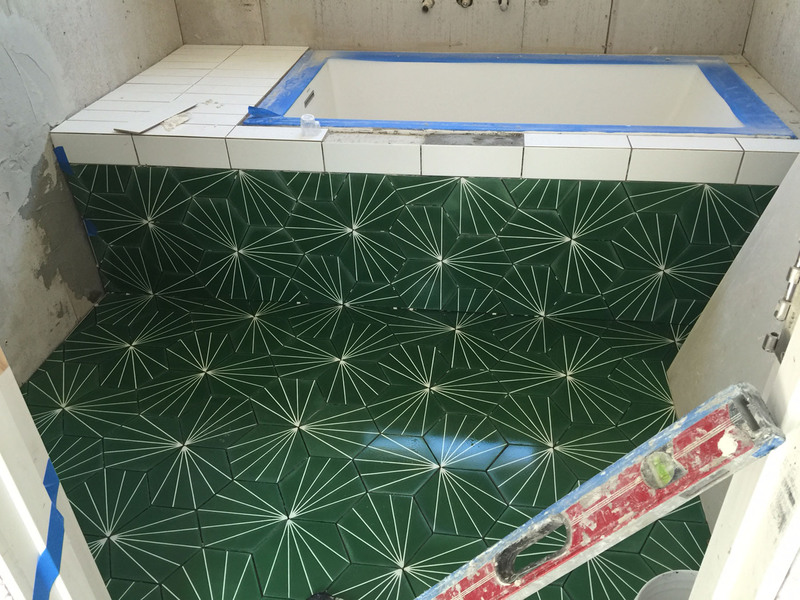 The other special tile areas will be in the master bath, and the kitchen backsplash. I promise updates as soon as they’re installed! Everything aligned perfectly at the tub corner. This entry was posted in Oxford Square, Projects and tagged construction, Interiors, Tile. Bookmark the permalink.